Alstom has unveiled the rail industry’s highest-capacity welding robot at its Le Creusot site in France, which is its bogie specialist. Farman, one of its suppliers, developed the robot. It combines three different robots in one. By automating processes, the workers at the site will have additional time to learn more skills, while not having to perform all the strenuous tasks they did in the past. CAF is to perform preventive and corrective maintenance on Italy’s high-speed Frecciarossa fleet. There are 59 ‘Red Arrow’ trains in total. The contract is worth 120 million euros (134 million USD). The original contract has a runtime of six years. It also comes with the option to extend by six years. French rolling stock manufacturer Alstom has unveiled its new train for Montréal’s Reseau express métropolitain (REM). Based on its Metropolis platform, this light metro system will be fully automatic. In total Alstom will deliver 106 two-car trainsets to the Canadian city. Alstom, working as part of a consortium, won the contract in 2018. The REM project is the city’s largest public transport project since it opened its metro in 1966. Lines 16 and 17 of the Grand Paris Express are to get a further 23 three-car trains from Alstom. This new order is based on an option from a contract between the two parties from September 2018. Alstom says the first of these trains will be ready by 2022. Alstom’s Valenciennes Petite-Forêt site will be principally responsible for the order. However, Ornans, Le Creusot, Tarbes, Villeurbanne and Saint Ouen are also contributing. Mobility solutions provider Bombardier has won a contract to upgrade the New Generation Rollingstock (NGR) trains for Queensland, Australia. Bombardier will perform the modifications and improvements with its partner Downer EDI. The contract is worth 361 million AUD (255 million USD, 228 million euros) and includes design, delivery and maintenance of the trains. 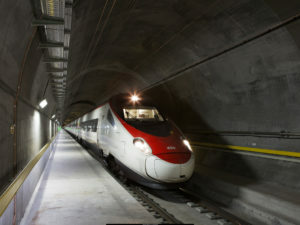 The Swiss high-speed train that is to run through the Gotthard Base Tunnel, which opened in 2016, has received its operating licence from the Swiss Federal Office of Transport. Named the ‘Giruno’ by the operator, Swiss Federal Railways (SBB), the Stadler SMILE has been granted permission to run at 200km/h. The train is capable of operating at 250km/h, something it can take advantage of outside of Switzerland, e.g. in Germany. The WWF organises Earth Hour every year to highlight the issue of climate change and to motivate individuals and businesses to move towards more sustainable energy consumption. Deutsche Bahn is Germany’s biggest consumer of renewable energy. Furthermore, moving people and freight by rail is a positive environmental choice. Consequently, Deutsche Bahn has been a keen supporter of Earth Hour and once again participated in the event in 2019. The Railtex show will take place at the NEC in Birmingham, UK, on 14–16 May 2019. The British rail minister Andrew Jones will give his speech at the Future Focus Conference on Wednesday, 15 May, at 10:30am. Senior representatives from Crossrail 2, High Speed Rail Industry Leaders (HSRIL), Digital Railway, Rail Freight Group and others will join him at the event organised by RIA.